Unfortunately, one sometimes comes across things which are of great interest but for which there is little to no information provided. This chasuble is one such example -- and its beauty is such that it would seem a shame to not show it all the same. 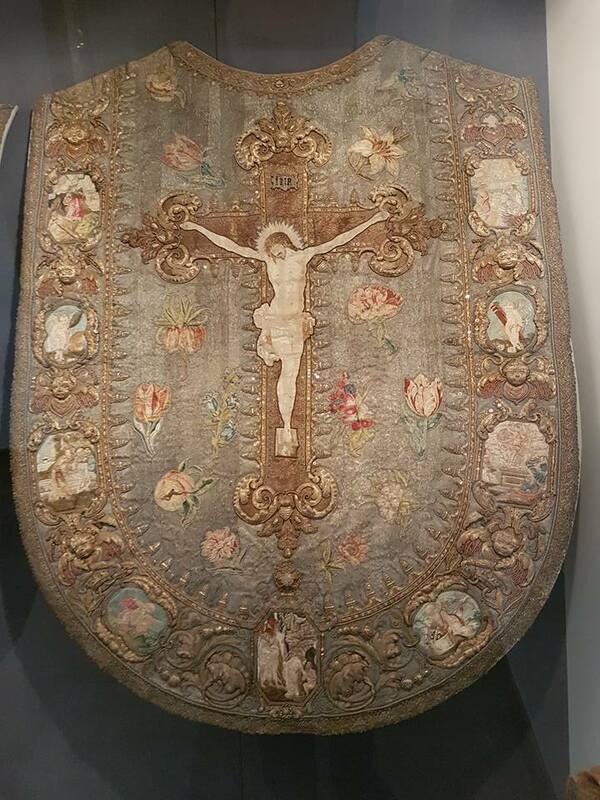 The chasuble it is apparently found in the National Museum of Denmark -- though I have yet to find it on their website. Speaking personally, I would suspect this comes from the late 17th century to the early decades of the 18th century, being neither fully baroque on the one hand, nor more typically renaissance on the other. The ornamentation is also suggestive to me of this time frame -- with 18th century vestments being more typically (though not exclusively) made up non-pictorial imagery and renaissance vestment work often including figurative and scenic images of this very 'genteel' sort of palette and style. Yet it includes elements of both periods which perhaps speaks to a transitional period. In terms of the liturgical colour, without seeing additional images of it, I would suspect this was intended as a festal white vestment of some sort all things being considered. 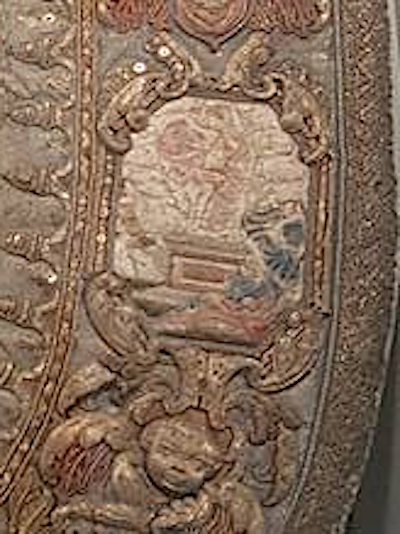 The chasuble features most prominently the image of the crucifixion of course, surrounded by various flowers -- a lily, rose, possibly tulips and other flowers. 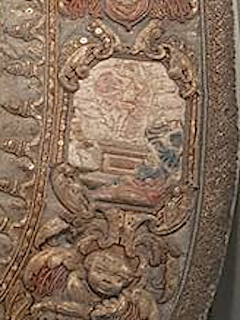 On the outer edge of the vestment are found various delicate scenes separated by the face of cherubs -- another aspect which seems to speak to the aforementioned period. The scenes include angels as well as various scenes from the life of Christ, including the Resurrection, possibly the Annunciation, and others -- sadly, the resolution of the image makes it difficult to see all of these scenes, but they seem to represent the life of Christ and possibly the Virgin Mary. I thought I would seek out another's opinion on this piece, so I spoke with a vestment maker and his own thought was that this was possibly mid-18th to early 19th century. Whatever the case, one thing is for certain: this is certainly a very fine and noble example of vestment work.